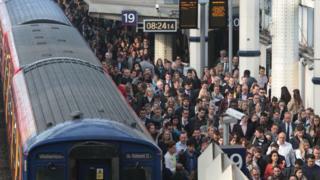 Britain's busiest and quietest railway stations have been revealed in figures from the rail regulator. Its data showed the quietest station, Shippea Hill in Cambridgeshire, had just 22 entries and exits across the whole of last year. London Waterloo was the busiest station, with more than 99.2 million entries and exits in the last year. Campaigners and industry groups said the report highlighted the impact of station facilities on footfall. The 'top of the stops' report released by the Office of Rail and Road (ORR) recorded the estimated number of 'entries and exits' - based on the total number of people travelling from or to the station. The total number of estimated entries and exits at Britain's stations in 2014-15 reached nearly 2.8 billion, an increase of more than 119 million, or 4.5%. Almost all of the top-10 busiest rail stations were in London, except Birmingham New Street station which was said to have 35.3 million passenger entries and exits at the station last year. In contrast, Britain's quietest station in Shippea Hill sees one train each weekday to Norwich, while on Saturday there is one train to Norwich and one to Cambridge. Below are the top 10 quietest stations in the UK from 2014-15, with 2013-14 figures in brackets (based on the total number of passenger exits and entries). The ORR report also highlighted reductions in estimated entries and exits at certain stations, such as the 12% drop of 6.9 million at London Bridge station, which it said was partly due to engineering works. Charing Cross trains and cross-London Thameslink services have not stopped at London Bridge since January as part of works to redevelop the station. The news comes as track operators Network Rail agreed to create a £4.1m fund to benefit passengers after alleged poor planning of upgrades at the station caused delays and overcrowding. Once a regular commuter on the Cambridge to Norwich line, I'll never forget the first time the train trundled to a halt in the middle of the Fens - before looking up and seeing that I'd stopped at a station - Shippea Hill, the UK's quietest according to new figures. It's a request stop - you've got to tell the conductor you want to stop there, and from memory there was just one train in the morning that allowed you to do so. I recall one teenager getting either on or off some mornings, but I have no idea how they got there or where they would be going to. Despite being just 10 minutes or so outside the cathedral city of Ely, there's just fields... and fields... and not a lot else. Campaigners and industry figures said the standard of facilities across the rail network had positive and negative effects on station usage. Martin Abrams of the Campaign for Better Transport group, which supports sustainable transport, said problems at stations like London Bridge were reflected in the "drop in passenger numbers". He said it was "vital" the government tackled pressure on the network from the overall increase in passengers with "smart ticketing, flexible season tickets for part-time workers and improved rolling stock". Mr Abrams added that despite the fact some rural stations were the quietest, "there are plenty of examples where targeted investment in smaller stations has boosted passenger numbers considerably". A Department for Transport spokesman said: "These figures are further proof that Britain's railways are booming, which is why we are investing record amounts in building a world-class railway that can meet this increased customer demand." They said the investment was part of a wider plan to make journeys "better for everyone" by improving stations and facilities, tickets and pricing, and journey times. A spokesman for the Rail Delivery Group, which represents train operators and Network Rail, said it was "no surprise" that improvements made to stations like Birmingham New Street and Stratford also coincided with "huge increases in people wanting to use them". He added: "Growth at even the smallest stations is proof that when the rail industry works together to improve facilities, passengers vote with their feet."